Portobello Bulgogi Korean Tacos...AMAZING! This is one of THE BEST dishes I've ever made. I had to modify the recipe (because it was loaded with oil), but it didn't hinder the flavor or texture at all! 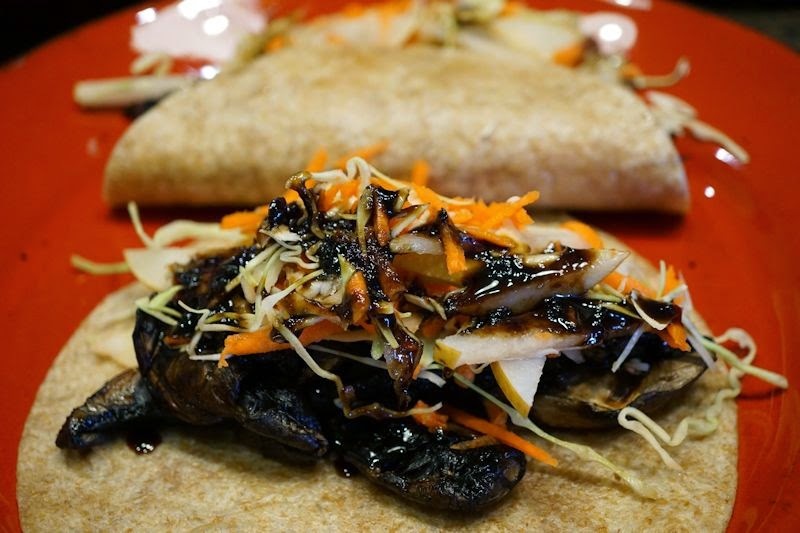 NOTE: This recipe can be made with soy curls instead of portobello mushrooms. Just make sure to add 3/4 cup cold water to the marinade instead of only 2 T. You need more water because the soy curls are dry, and they don't have the water content that mushrooms have. First, soak soy curls in water for 10 minutes first and squeeze out the water. Make sure to mix the soy curls into the marinade well and stir them a couple times before baking them on nonstick foil at 375 degrees for 25 minutes. Two to four hours before cooking, whisk together all the marinade ingredients for the mushrooms. Add portobellos and toss to combine. Cover and refrigerate for 2-4 hours. When ready to cook, heat the grill to medium-high. Place the mushrooms evenly on the grill or toss into a grill pan if you have one. Reserve the marinade. Cook about 10 minutes total, flipping halfway. While the mushrooms cook, pour the reserved marinade into a small pot. Set to medium-high heat and bring to a boil. Boil about 10 minutes total until reduced to a thick syrup. Set aside. Warm or steam the tortillas. Spoon slaw on the bottom of each tortillas. Top mushrooms and slaw with the reserved sauce.